The day after Santorini, we found ourselves in Heraklion, Crete. 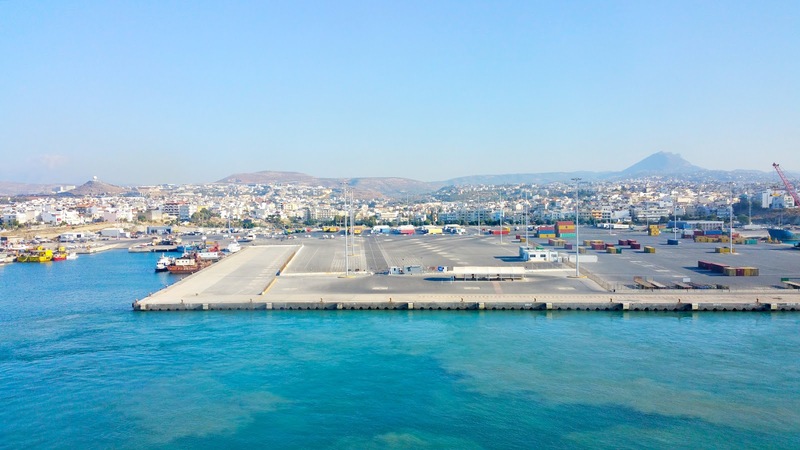 The island is Greece's biggest and most populous and functions practically as a mini-nation of its own. 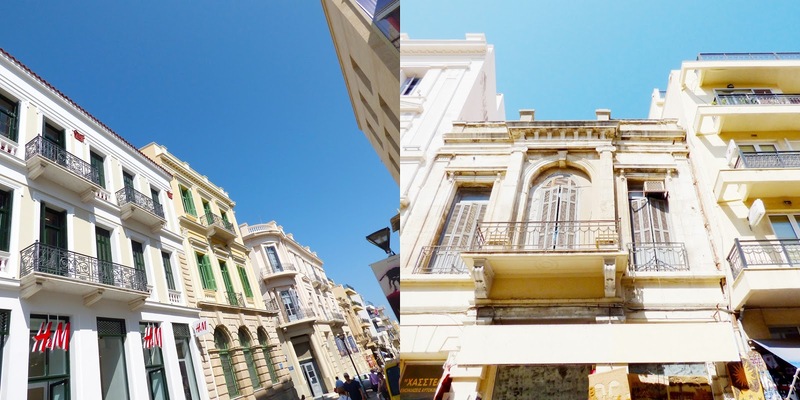 The port city of Heraklion has a population of 137,000 and is an urban, function capital. The city has a top notch archeological museum that displays the best collection of Minoan artifacts anywhere. So that was our first stop. One of the highlights of the museum is the collection of Minoan frescoes from the lavish palace of Knossos. The Bull Leaper illustrates the popular pastime of vaulting over a bull. It was a happy, fun loving society that enjoyed its leisure activities. The Minoans revered bulls. While they would vault over them, they never sacrificed them or conducted Spanish-like bull fights. 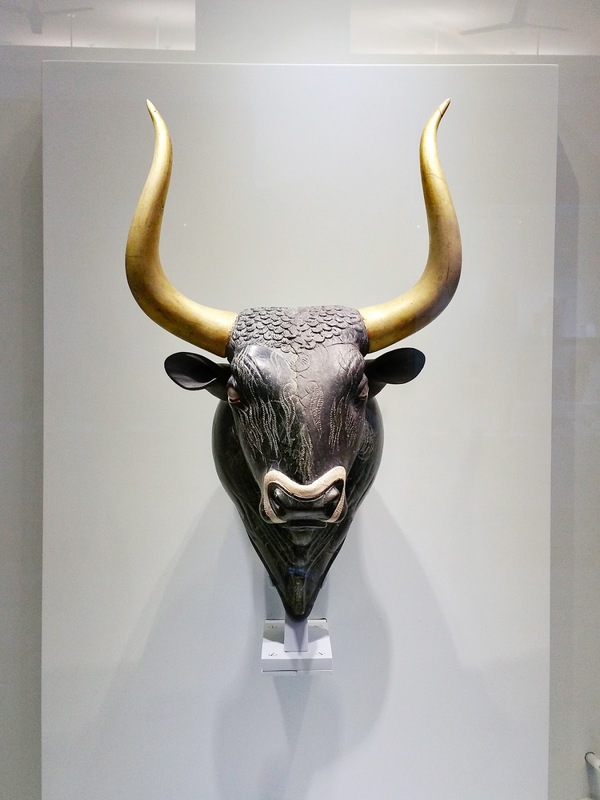 This gorgeous bull's head is a drinking vessel called a rhyton and has jeweled eyes and golden horns. The snake goddess was a particularly popular deity in Minoan culture. She was depicted as a bare-breasted, snake-handling woman that is thought to be perhaps the guardian of the home, or maybe she symbolized new life and fertility. Burial urn complete with human remains. The biggest clay pots I've ever seen. In about 1450 B.C. Minoan civilization suddenly and completely collapsed. While no one knows for sure what happened, it is thought that perhaps the atomic-bomb sized eruption of the Santorini volcano caused earthquakes and a tsunami that swept the Minoans into the dustbin of history. The museum was newly renovated, blessedly air conditioned, and served as a fascinating glimpse into this fairly mysterious ancient civilization. Leaving the cool confines of the archaeological museum, we headed out into the capital city itself. The city was founded by Saracens and then expanded by Venetians during the crusades. 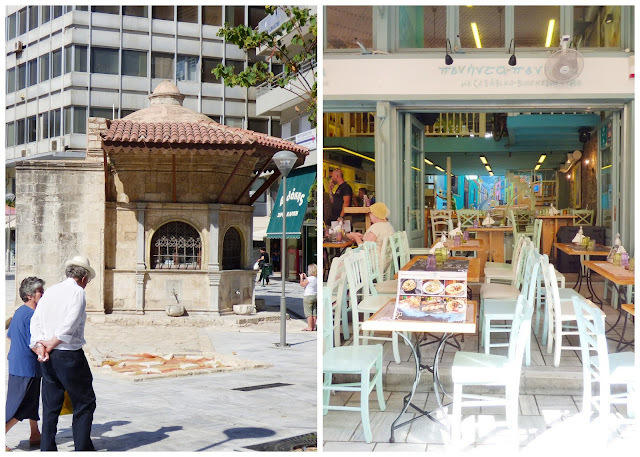 Today, it is a modern, bustling city that feels similar in ambiance to Athens. Old | New The main part of town focuses on the Venetian flavored Venizelos Square and its trademark Morosini Fountain. The streets around it are fun to explore with shopping and cafes. One of the first buildings built by the Venetians was the Church of St. Mark, in honor of their patron saint. The church has been worked on, renovated, and changed since it was first started in 1239. The Agios Titos, or St. Titus church, holds the skull of the namesake saint who was the first bishop of Crete. The Venetian fortress of Castello a Mare dominates the entrance to the harbor. Built in the 16th century, the fortress served to strengthen defenses around the city. Other aspects of the old Venetian harbor also remain. There were posters along this vault showing movie scenes that had been filmed in the old harbor. Little panoramic of Heraklion from near the harbor. Our family Crete, Greece on Tuesday August 30th 2016. The next port of call was Argostoli, Greece and we took a side trip to Melissani Cave! What beautiful history you got to visit! LOVING all the photos! And those clay pots are crazy huge!!!!!!!! !